Antoine and his family just moved to Australia about 2 years ago, and they have been spending much of their free time exploring the country. They live close to a beautiful beach and enjoy hiking in the wonderful parks nearby. The work Antoine does combines physics, chemistry, and biology. He develops new types of microscopes to visualize complex biochemical reactions at the level of individual molecules. In particular, his group is interested in how DNA is copied before a cell divides. Antoine is also doing research examining how bacteria acquire antibiotic resistance. In high school, Antoine had a fantastic physics teacher who really got him excited about physics. He majored in physics in college, but wasn’t convinced he wanted to be a scientist until he got experience working in a lab. Doing experiments and thinking of ways to solve problems at an experimental level sold Antoine on a career in science. His interest in the biology of DNA replication came later while sitting in a freshman molecular biology course during his postdoctoral fellowship at Harvard. The first two years of Antoine’s postdoctoral fellowship were really difficult. He couldn’t get anything to work, and he started to doubt his decision to pursue academic science. Antoine sent out 50-70 applications for industry jobs and didn’t get a single positive response. Though disheartening at the time, this turned out to be a good thing. Around that time, his projects in the lab started to work, and his motivation and enthusiasm for science returned. Recently, Antoine had a paper accepted that described a fantastic series of experiments done by a postdoctoral fellow in his lab. It took them more than 2 years of battling reviewers, performing additional experiments, and revising the the paper to get it published, so this was an exciting victory. Antoine’s first trip to Japan occurred during the end of his time as a postdoc, and his wife was able to accompany him. From the moment he stepped off the plane, he was attracted to the sense that the country was different from many of the other places he had been, both physically and culturally. The food was phenomenal, and Antoine particularly remembered visiting an old palace with a large, creaky wooden floor that served to alert the occupants of intruders. In his lab in the Netherlands, whenever someone graduated with their PhD, the lab would make a short movie to commemorate the event. Different people in the lab would dress up and play the role of the new graduate, complete with quirks and funny memories from their time in the lab. Also, Antoine has enjoyed learning about the unexpected hobbies and interests of the people in his group over the years. In terms of his own interests, Antoine got his pilot’s license a few years ago and has fun flying whenever he can. Focus on what you think are the important questions, rather than other people’s expectations of what you should be working on. Try to identify something in life that you get really excited about, and pursue that thing with all your heart and effort. After receiving his PhD in Physics from Leiden University (the Netherlands) in 2001, Antoine van Oijen was a postdoctoral fellow at Harvard University’s Chemistry department. In 2004, he started his own group at Harvard Medical School, followed by a move back to the Netherlands in 2010 as a full professor at Groningen University. In 2015, he moved to the University of Wollongong, Australia, as an Australian Research Council Laureate Fellow. Trained as a physicist, Antoine develops new microscopes to visualize individual protein molecules and how they behave inside living cells. In particular, he is interested in understanding how cells duplicate their genome before cell division and how they repair their DNA upon damage. 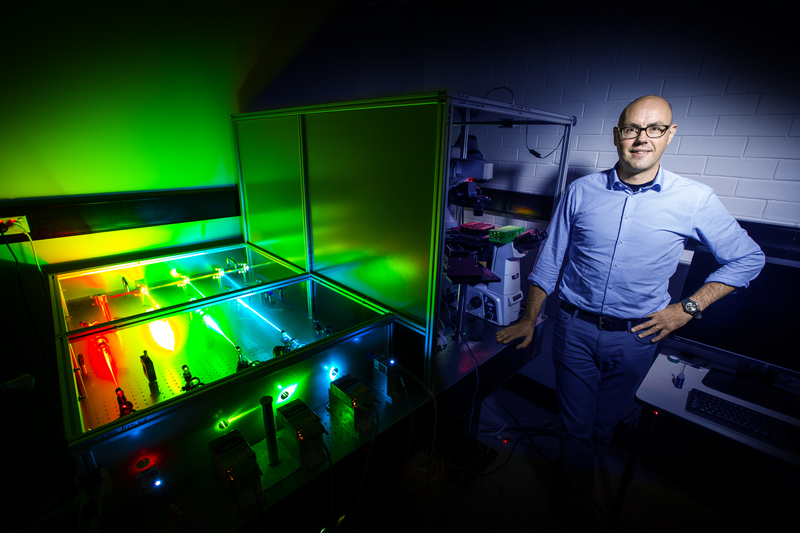 Using novel single-molecule fluorescence imaging and mechanical manipulation techniques, his work has allowed the first direct visualization of the dynamics of individual replisomes, the large multi-protein machines that replicate DNA. He also works on the visualization of the proteins responsible for introducing resistance mutations in bacterial cells when they are exposed to antibiotics.